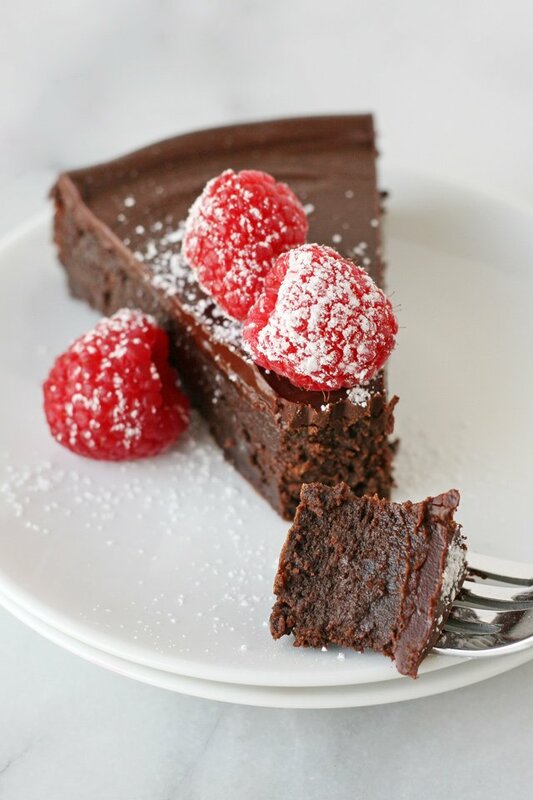 This Flourless Chocolate Cake recipe is rich, delicious and simply the ultimate chocolate treat! If you’re not a fan of chocolate, this recipe may not be for you. 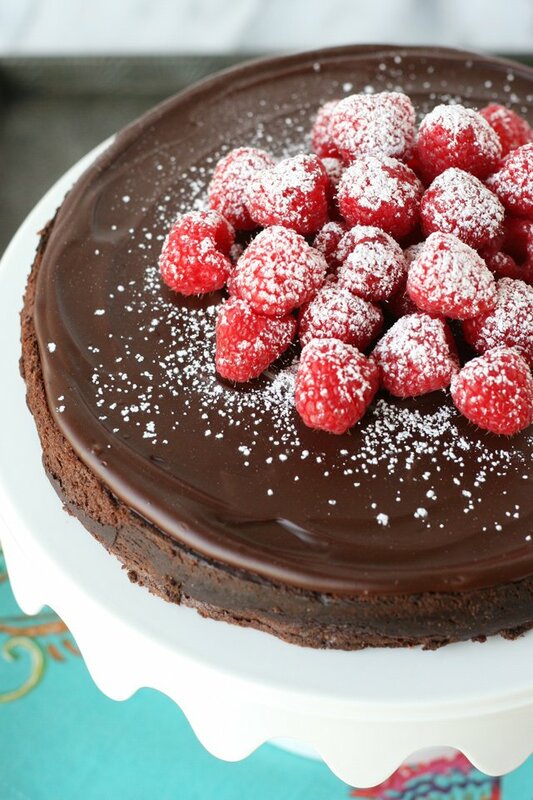 This beautiful, ultra rich dessert is packed with chocolaty goodness! This flourless cake could be described as the fancy version of a brownie, although the texture is more dense than a traditional brownie, and the flavor is so rich, it’s almost in the fudge category. Even the most devout chocolate fans will likely be satisfied with just a sliver of this gorgeous cake! I was inspired to create this pretty cake after my recent Mexican Riviera Cruise with Princess Cruises. 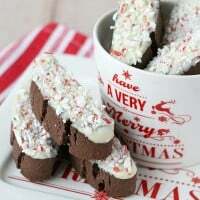 I enjoyed several impressive and delicious chocolate treats on board Princess Cruises and wanted to share a recipe that is easy to create at home, but lends itself so perfectly to a fancy garnish and more formal entertaining. I chose a relatively simple garnish of fresh raspberries and and dusting of powdered sugar, but this would really be a perfect recipe to let your creativity shine! 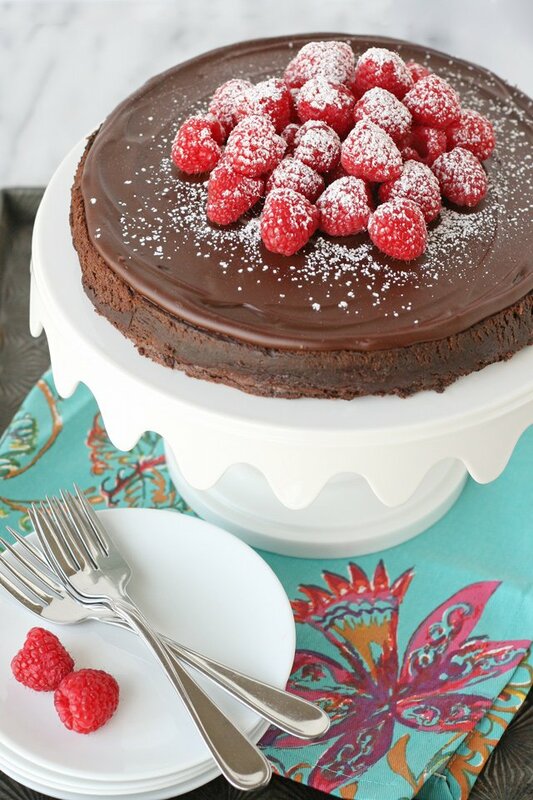 An artful drizzle of chocolate on the plate, or a raspberry sauce would be gorgeous with this cake. Initially, I considered the raspberries simply a beautiful garnish for this cake, but I discovered the tartness of the fruit was really a perfect compliment to this rich cake. I would highly recommend including fresh raspberries or fresh strawberries as the perfect accompaniment to this cake. 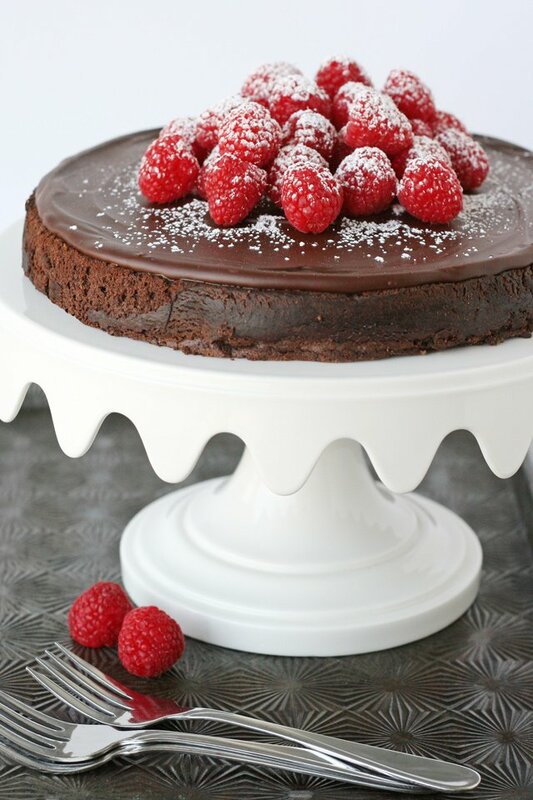 Certainly, this flourless chocolate cake would be a perfect recipe for those who require a gluten-free diet. And it’s so rich and utterly delicious, that any chocolate fan will fall in love with this recipe! Rich, flavorful and simply the ultimate chocolate treat! Dense and almost fudge-like. Preheat oven to 300°F. Prepare a 9" cake pan by lining the bottom with parchment and lightly buttering the sides, then dust with cocoa powder and tap out any excess. In a medium sized (microwave safe) bowl, heat the chocolate (break into pieces if using large bars) & butter at 50% power in the microwave until mostly melted (about 2 minutes, but check after 1 minute and every 30 seconds after). Stir until fully melted and smooth, then set aside. In the bowl of an electric mixer, fitted with the whisk attachment, whisk the eggs on medium speed about 1 minute. 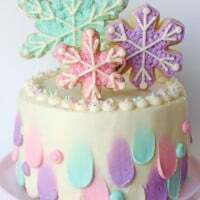 While mixing, add sugar, vanilla, salt and water and continue whisking another minute or so, or until the mixture is very foamy, pale in color and has doubled in volume. Reduce mixer speed to low, and gradually pour in the (cooled) chocolate mixture. Increase mixer speed to medium and blend until well incorporated, about 30 seconds. Add the cocoa powder and blend just until fully incorporated. Pour batter into prepared pan and bake 40-45 minutes. Bake just until the outside edges are fully baked, and a toothpick inserted in the center comes out with moist clumps, but not just wet batter. It will seem under-baked by most cake baking standards. Don't overcook. Remove from oven and cool in the pan (on a wire rack) for 30 minutes. 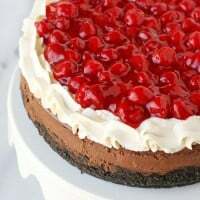 The cake will sink quite a bit in the center, leaving a rim around the edge, this is OK. Cover the pan with foil and move the cooled cake to the refrigerator and refrigerate until very cold, at least 6 hours or overnight. Once well chilled, run a knife around the edge of the pan to loosen the cake. Remove from pan and trim off the raised rim around the edge of the cake, as necessary to level. Turn cake upside down onto a platter (so the bottom of the cake is now the top) and remove parchment paper. Prepare glaze by heating the chocolate and butter in the microwave (at 50% power) until almost melted, then stir until fully melted and smooth. Cool slightly, then use an offset spatula to spread the glaze evenly to within 1/4 inch from the edge of the cake. Allow to set up (at room temperature, unless your house is very warm and in that case, cool in the fridge). Cake should be served at room temperature. To serve, cut into very thin slices using a knife that has been run under hot water, then wiped dry. Clean knife between cuts as needed. 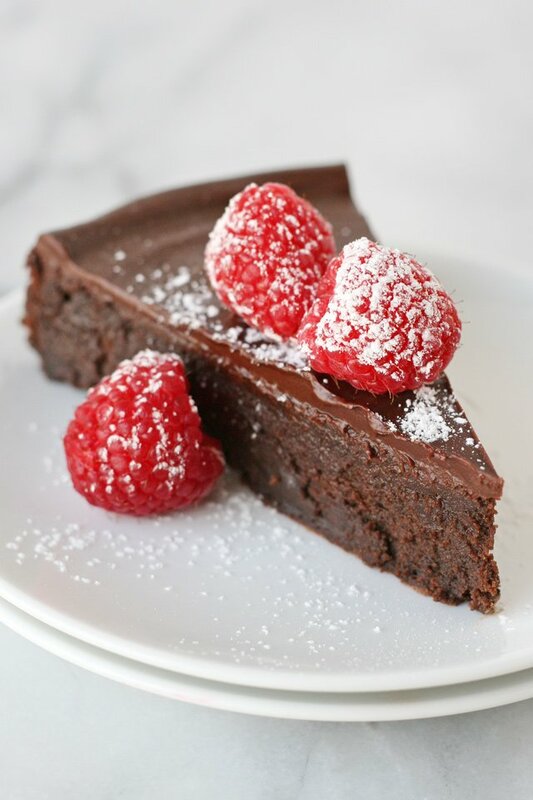 Chocolate is the star of this dessert, so choose high quality chocolate and cocoa powder (such as Ghirardelli or Guittard) for best results. Garnish cake with fresh raspberries or fresh strawberries (make sure they are dried really well after being rinsed). The fruit garnish is not only beautiful, but a perfect flavor compliment. I used Challenge brand butter, please feel free to use a high quality brand of your choice. Disclosure – I’m sharing this recipe in partnership with Princess Cruises. Partnering with brands I love allows me to provide you with high quality content at no cost to you. I only work with brands I use and love. All images, text and opinions are my own. Yum. Can I have some now? Looks like it taste incredible. 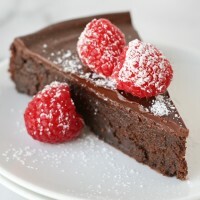 I’ve been on a search for a great flourless chocolate cake recipe. This one looks so good! I’ll definitely be trying it out soon! Oh, goodness! If you hear a knock on your door . . . it’ll be me looking for a slice! ! ! This looks YUM! ! ! ! Hi there … mmmmm looks so delicious. I want to make it, but am not sure of the measurements, ie cups, cos I am in the UK and we have metric or imperial, lbs and ozs. I guess this is quite an expensive cake to make and if it did not turn out right …. the disappointment would be humongous!!!! your photos are lovely! Please please cld you write the measurements in metric or imperial?? Thanknyou so much! I do not have the metric measurements on hand, but feel free to use google to find a good measurement equivalent chart and I’m sure you’ll be able to find what you need. I made it with 340g plain chocolate, 175g butter, 5 medium eggs, 225g sugar and 60g cocoa powder. I just used Tesco value chocolate which kept the cost down and still made an amazing tasting cake. I did have to cover the top midway and cook it for longer than stated. Very very moist indeed, not that I’m complaining. We actually ate half of it hot straight out of the oven before adding the glaze but I plan on doing that today. Quantities for the full cake would be 45g butter and 115g chocolate for the glaze. Another wonderful recipe to try out! I’m sure my family will be very thankful to you for inspiring me! This is in my oven right now. I’m making it for a big family Valentine’s dinner tomorrow, and I can’t wait to taste it! The batter is so gorgeous, I’m sure it’s going to turn out great! I’ll try to remember to comment after I’ve tried it. It seems like it’ll be a winner! Thanks Holly Painter for the metric measurements. Hi!! Important question how much chocolate and butter in step 2 and step 9? It doesn’t specify. For step #2 you should be using the chocolate and butter listed for the “cake” portion in the ingredient listings. Then for step #9, use the ingredients listed for the “glaze”. Happy baking! I have to use alternative sweetener ….like monkfruit sugar do you know how that will affect the cake? Can we use a springform pan in 9 inch? I used a springform pan. The cake was high on the sides, not sure why. My oven seemed off and the 300 degrees seemed to take much longer than the instructions. I am hoping it tastes good! I just made this cake and I am so proud that it looked like yours and tasted delicious, however, each piece I cut just crumbled into a mess. Any idea what happened? Did I bake it too long? Did I beat the eggs too long? 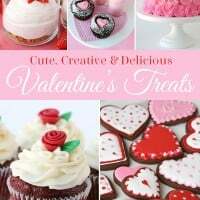 Btw, I love your site and it is my go-to for any dessert recipe! Thanks! Just made this and OMG YUMMMMMMMMM!!!! It’s like a mousse cake, it’s super rich and super dense but delish!!!! I didn’t put the icing on top, not needed! !